The Atlantic range comprises steam to water calorifiers, calorifier/flash condensers and fully packaged calorifiers/flash condensers/condensate pump-sets. These are mostly used in heating systems to transfer the heat from steam to hot water. The majority of applications are for heating LTHW (82/71°C) although the calorifiers can be used for MTHW and HTHW generation if required. Other applications may also arise with different water temperatures and materials of construction. These are single calorifiers. Saturated steam heats the water by condensing in the calorifier and transferring latent heat through the walls of the tubes. For most systems the AT calorifier is the most economical solution. AT Construction: All units are of robust construction. Tube bundles have substantial supports and baffles and are withdrawable for inspection. Design and construction are to BS853. 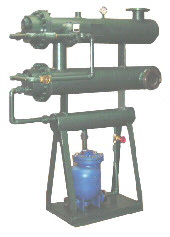 An ATC unit effectively comprises two calorifiers and an intermediate trap-set and pipework. Saturated steam heats the water by condensing in the first calorifier and transferring latent heat through the walls of the tubes. The resultant condensate is effectively at the same temperature & pressure as the steam. Therefore when this condensate is discharged though the trap its pressure falls and flash steam is given off. The second calorifier condenses the flash steam and cools the condensate - transferring the heat (which would otherwise be wasted) to the secondary water. The final temperature of the condensate depends on the secondary water return temperature. In the case of LTHW (82°C flow 71°C return) the condensate will be cooled to 90°C approximately. These not only heat water but collect and pump away the condensate as well! Performing all the functions of the Atlantic ATC units but with a condensate receiver and automatic condensate pump (steam or compressed air driven), these units solve frequently encountered difficulties of condensate removal. The condensate receiver and pump can also be used to remove condensate from other items of plant nearby, provided this is taken into account at the design stage. Please note that a separate steam or compressed air supply is required to power the pump.